Silo thinking is often named as one of the problems of effective strategy execution. Let’s analyze the case to find out what the real problem is and how to fix it. Organizations are divided into silos – Sales, Marketing, Customer Service, IT, R&D… This approach is natural when you need to get a sense of a big and complex system; this is also a great way to divide responsibilities and scale organization. The problem is that neither clients’ requests, nor business challenges in general fit into a single silo, on the contrary, they tend to go across organizations. The most important question: will they go through-out the silos effortlessly or not. Second, in the self-organization there are envisaged some safety mechanisms like creating peer pressure, antibody framework, and a process for conflict resolution. Finally, the “solution” part for the silos problem is very similar to what is implemented in self-organizations. Performance metrics are still there and there is even a higher focus on discussing challenges with your colleagues. There is nothing wrong with silos. The actual problem is isolation! The idea is not to smash silos in the company, but to ensure that there are effective communication channels between them, and that they have a shared strategy in mind. These are good indicators of an existing silo problem, but the best one is probably customer’s experience (not what you think customers should experience, but what customers are actually experiencing). Customers don’t deal with one silo only; they go across them! For example: you might have Marketing, Sales, Logistics, Delivery silos. But customer deals with all of them. He or she sees some advertisement, visits your store, buys your products, contracts delivery. Put yourself into customer’s shoes to check out whether there is a seamless communication between silos or not. OK, we have some silos with isolated thinking. How do we fight with them? A short answer is that one needs to re-think the organization of their companies and do it regularly. If you exist in business for more than 1 month, then you already did it in some way. But there is always a space for improvement. Below you will find some disciplined silo-combating approaches. Get together “experts” who are close to the challenge, and stake-holders from other business units; ask them to start working on the problem. Implementation and process check in 30, 60 and, 90 days. According to recent HBR publication this Jack Welch’s approach still works fine. Objectives to the thematic goal, so that employees have a better idea about specific objectives that they can start working on. In the best traditions of “smart” goal settings “Thematic goal” and “Objectives to the thematic goal” need to be time-bounded and shared. A prospect client from a big financial institution commented to me that due to their size, distributed locations, and wide range of functions, they found their business to be separated into many silos. They saw our Balanced Scorecard software, BSC Designer, as a “hard” part that would support their “sort” efforts in their combat against silos. Their plan was to implement strategy maps to create a sense of shared strategy, and align KPIs with their business goals to achieve coherence in strategy execution. Articulated vision for your organization. A good addition will be to formally define the mission statement and the company’s values. Avoiding business jargon, I’d say that a good vision has two functions: motivate your team, and give your people a direction to move toward. Company’s culture (easier said than done) that should promote such principles as trust, transparency, collaboration, and focus on the customer value. Among all of the mentioned concepts the most important is trust. A very basic, but still very effective idea: sooner or later any organization becomes a copy of its leader, so if you want your company to care about your clients, then be an example yourself. Later, you can find a team building consultant who will introduce necessary “hard” parts and methods. Tangible strategy aligned (cascaded) across silos. Big goals and smaller objectives described on the strategy map and aligned with the departments. To make strategy tangible it is good idea to use a strategy map. Remember, a strategy map is not about drawing blocks with things to do, it is about working with educated hypothesis that your team generates. Strategy must be a product of the disciplined discussion, not a set of ideas translated top to bottom. You can use strategy maps as a base for these discussions and/or practice an approach similar to GE Work-Out. Performance metrics (KPIs). They should work as a way to track the performance, and make strategy execution process even more tangible. When working on these components remember famous Peter Drucker’s quote: “culture eats strategy for breakfast.” If you rub your hands and plan to work on the KPIs and strategy map part, then you better stop and invest 80% of your time into the cultural aspect. Without proper culture, KPIs and strategy map will soon be reduced to another formality. For each goal you will be just fine with 1-2 metrics, no more. Even if you know that you need a 50-page SLA to ensure that two silos are collaborating properly, make sure that there is its shorter version, for example a projection of the key principles of this SLA on the graphical map (strategy one?) with a few important metrics. How can the management team possibly track their efforts and the results in silo combating? My personal opinion is that direct studies of employee engagement, strategy awareness, or easiness of communication are not the best in this case. Managers will adjust their radars to finding improvements, and for sure, they will find some. Its lagging pair should estimate quality by some criteria applicable in this case (like “The number of problems reported by customer,” or “The number of returning problems”). In this way you will be able to track the achievement of the desired results (increased to time market), and make sure that the quality of the product or service was not affected. Silos are there in organizations to support their structure and allow to scale them. 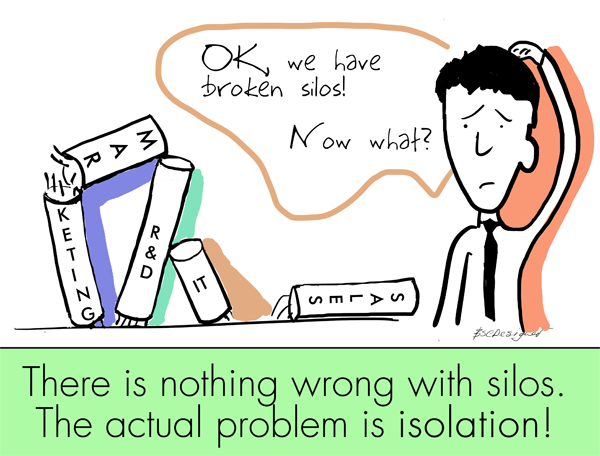 By silo problem we are referring to the problem of isolation, not the division into the units itself. To combat silos, you need to make it easier for your business units to understand each other. Start with business culture, then use such tools as vision, values, strategy maps, performance metrics. Make sure that your team actually follows a prescribed diet, a leader in your organization need to promote and sponsor the idea of cross-unit discussions. How do you combat silos? Share your experience in the comments!